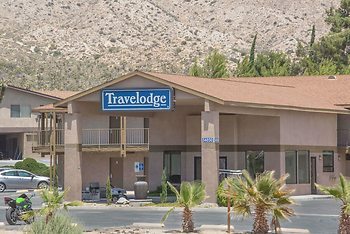 Hotel Travelodge Inn & Suites by Wyndham Yucca Valley/Joshua Tree, Yucca Valley, United States of America - Lowest Rate Guaranteed! With a stay at Travelodge Inn & Suites by Wyndham Yucca Valley/Joshua Tree in Yucca Valley, you'll be in the mountains, and 13 mi (20.9 km) from Joshua Tree National Park West Entrance and 23.4 mi (37.7 km) from Palm Springs Aerial Tramway. This hotel is 24.7 mi (39.7 km) from San Jacinto Mountains and 25.5 mi (41 km) from Palm Springs Convention Center. The beds were very comfortable. Like sleeping on a cloud. The door was a bit tricky to open. Accommodated a late check out, and crazy water pressure. Bathrooms need upgrading ,,,despite awesome water pressure and hot water. The room was clean and the beds were very comfortable! I liked that the pool was so close to our room and it was clean. The only thing I would recommend is getting some umbrellas in the pool area for a little shade. The staff was great and very accommodating when we had to switch rooms because the first one wasn't cooling right. It was a nice place to rest. I left my telephone cord in the room and even though I called as well as my husband, they didn't seem interested enough to look for it. I can't believe it wasn't right in the room as we called right away once we discoverd it was missing. Easy to find and close to what we needed! It was an older hotel but it was clean, the comforter on both beds were torn. The television needs to be updated.